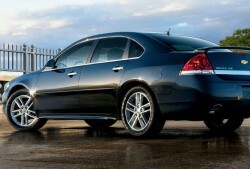 Baytech makes the Chevrolet Impala an NGV with alt-fuel (CNG) system installed. Baytech Corporation (Baytech), a wholly owned subsidiary of Landi Renzo USA (Landi Renzo), has developed a 50-state CARB and EPA certified dedicated compressed natural gas (CNG) system that will be available on the 2011 Chevrolet Impala and Buick Lucerne in the second quarter of 2011. This new offering will include the 6 cylinder 3.5L and 3.9L engines. The system includes Baytech’s gaseous fuel sequential Multi-Point Fuel Injection system technology using Landi Renzo manufactured system components. “This proven engineering technology and mass produced system components will allow us to offer a CARB certified CNG vehicle that has the cleanest rating and the most competitive price for a vehicle of this type,” says Andrea Landi, President Landi Renzo USA. “This vehicle will be the only CNG CARB certified passenger vehicle that is suitable for the taxi market, and will provide an affordable option for other fleets as well,” he added. Baytech, acquired by Landi Renzo in 2010, is a small volume OEM manufacturer of EPA and CARB certified CNG fuel injection systems for Chevrolet, GMC, Isuzu and Workhorse Custom Chassis vehicles. Baytech offers CARB and EPA certified light, medium and heavy duty CNG vehicles and engines in the industry. This item compiled using information from a Baytech Corporation press release.